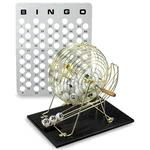 This ever popular Bingo game includes large bingo cage (handled for turning), balls, and calling board (place called balls on board for easy tracking). Disposable bingo cards are available for purchase. * Please call us for any questions on our bingo game rentals in Pipersville PA, Hatfield PA, and Bucks & Montgomery Counties in Pennsylvania.